On Saturday, nearly 6,000 protesters marched in the city centre of Berlin during the annual demo in remembrance of comrade Silvio Meier, who was killed by neo-Nazis in 1992. However, on the same day, approximately 150 thugs from the neo-Nazi scene held a rally in one of their strongholds, Schöneweide, against asylum seekers and a recent attack on a prominent Nazi (Björn Wild, who was beaten up by antifas on the street). The fascists waved Greek and Golden Dawn flags next to other nationalist emblems. The antifascist counter-demo on location was rather small in numbers. 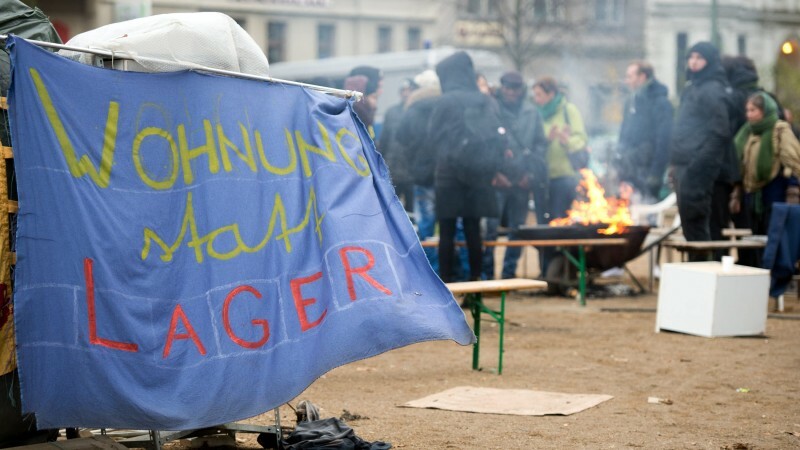 In Berlin, the refugee camp at Oranienplatz has been in imminent danger of eviction already since late November 2013. Refugees and people in solidarity are determined to keep the square as the basis of their struggle against the German asylum policy. However, Kreuzberg mayor Monika Herrmann of the Green Party (Bündnis 90/Die Grünen) asked the cops to prepare a raid on the entire camp. 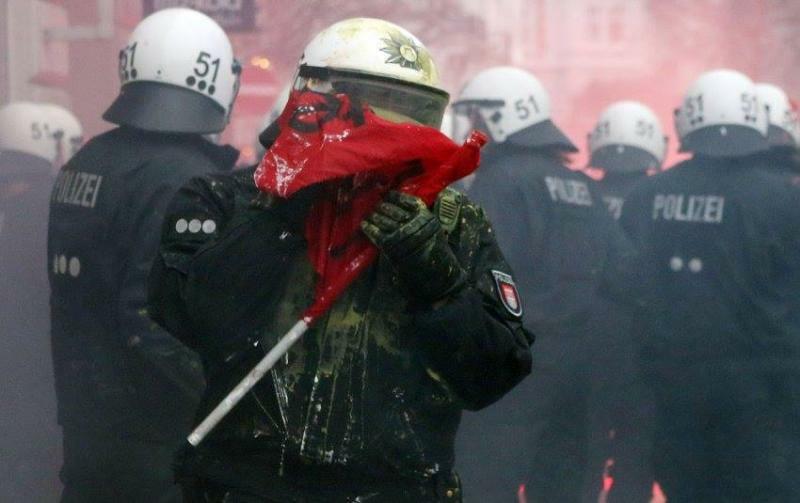 She also stated that leftist radicals try to take advantage of the situation… Following these developments, heavy police violence was unleashed at Orienplatz, however activists counterattacked on many occasions. The refugee camp at Oranienplatz exists for over a year now, and is a point of exchange between residents of Kreuzberg and refugees. There were several political attempts to end this square occupation, with subsequent police attacks. In summer of 2013, there was even a racist knife attack on a participant in the protest camp. The camp began after people in isolation camps, trapped by the restrictive German residency laws, broke out in order to march to Berlin. Refugees have made the camp both a living space and a site of struggle, and have also occupied a nearby school building (that was previously unused), in order to have an inside space during the winter. Both the camp and the occupied school building had been given official “tolerance” by the supposedly pro-refugee Green Party government of the district, in the face of large-scale support. After a disused building in Wedding was offered as winter housing to the refugees by a charity group, the Greens took the opportunity to claim that both the camp and the school should be evicted. The eviction threat comes despite the fact that the building offered only has space for 80 people from the camp, not everyone, and that the residents of the camp made it clear that they have no desire to leave the central and visible location in Oranienplatz to be put away in a house located on the northern edges of the city. However the State is using the rhetoric of democracy and charity to make it seem as if they are helping the protesting refugees, even as they call the police to evict them. When the word of the eviction spread, hundreds of supporters spontaneously mobilized to defend the camp and began arriving at Oranienplatz. The police backed down from the eviction, but those who had showed up to defend the camp launched a spontaneous demonstration through Kreuzberg. Between 500 and 600 people marched through the area and broke through police lines several times when the police attempted to stop the demonstration. As during the last several spontaneous demonstrations in Berlin, barricades were constructed as the demo passed through the neighbourhood. Eventually the cops, overwhelmed and facing kicks and punches from the crowd, used pepper spray heavily and at least 5 comrades were arrested and many injured. That night the nearby office of the Green Party was attacked with paint. The same day, a solidarity demonstration took place in Frankfurt am Main with 80 participants, and in Leipzig a solidarity demo of more than 150 people took place. 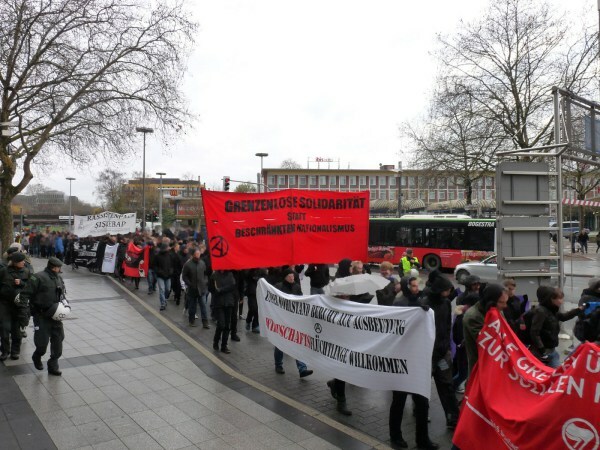 Further solidarity actions took place in Frankfurt, where a demonstration of 100 marched to the local offices of the Green Party and the SPD (Social Democratic Party). 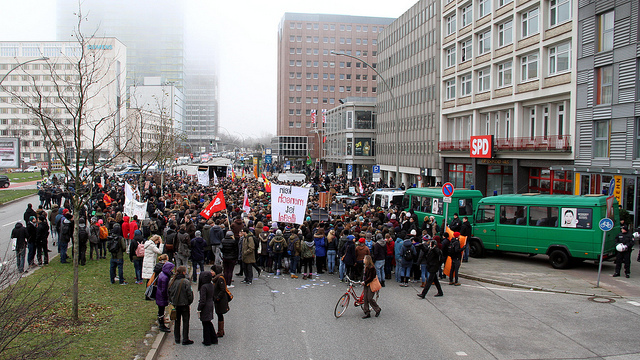 Over 250 people participated in an antiracist demonstration in Bochum. The march went through the inner city, where lots of people who were shopping on the Christmas market received flyers and listened to the speeches. In one speech, a refugee from Africa talked about the current situation in the camp in Heiligenhaus where she has to live. She thanked everybody for their support and invited people to come to the camp, take a look at her situation and to talk about how to organize the struggle in the future. Red banner reads: “Borderless solidarity instead of narrowed nationalism”; white banner reads: “Our welfare is based on exploitation – Economic refugees welcome” (in response to a racist ‘argument’ claiming that most of the migrants are only seeking state welfare benefits, and naming them ‘economic refugees’). More pictures here. The weekly demonstration of the group “Lampedusa in Hamburg” became an Advent Demo on Saturdays (before the holiday season, refugees and people in solidarity took to the streets every Wednesday in the city). On 30/11, nearly 1,000 people participated in that march. Later on, some 50 people demonstrated spontaneously for about ten minutes on the route of the Christmas parade, on the main shopping street. They unfurled banners and shouted slogans for the rights of refugees to stay. No detentions were reported. An antiracist unauthorized demonstration was stopped by cops at the Altona Christmas market. 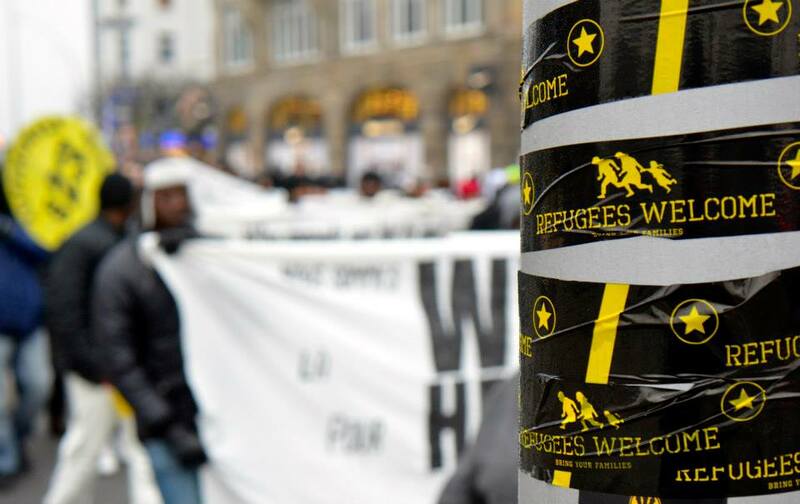 The second advent demo of Lampedusa refugees took place in Hamburg, counting with the participation of 700 people. About 50 people carried out a spontaneous demo in the afternoon through the inner-city streets of Mönckebergstraße and Jungfernstieg. 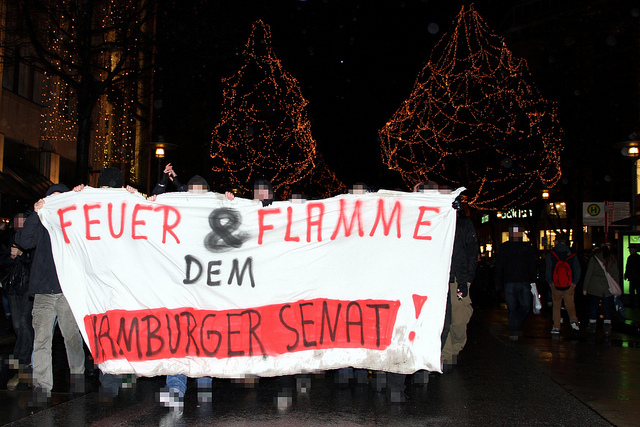 They carried a banner reading “Fire and flames to the Hamburg’s Senate!” The demo was soon kettled by the police, and participants ended their action. An unauthorized demonstration of about 50 people walked through the Christmas market of Bielefeld. The participants handed out leaflets regarding the German State’s key role in exploitation and war that are forcing people to seek refuge in other places. Police did not notice the action at all. 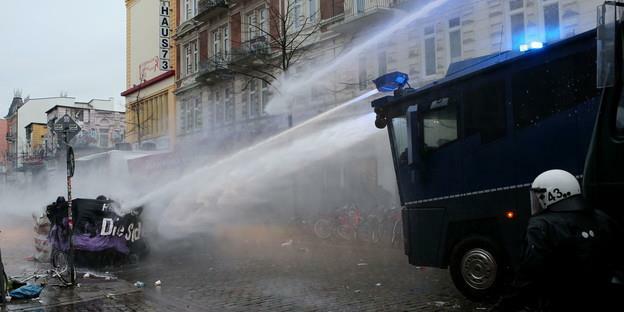 A spontaneous demonstration was held later that evening in the Schanze district in defense of the Rote Flora project. In a lively protest march in Berlin, around 1,500 people moved from the camp on Oranienplatz to the offices of interior senator Henkel, member of the major party CDU (Christian Democratic Union), in Mitte. The refugee camp on Oranienplatz was set for eviction between the 15th and 16th of December, but apparently Henkel has scheduled the eviction for mid January 2014. In Hamburg, all residents of the Esso houses in St. Pauli were evicted and forced to move to hotels or relatives, of course getting no help from the Senate. From Freiburg’s prison, long-term prisoner Thomas Meyer-Falk addressed a message of solidarity in view of the demonstration on December 21st in the city of Hamburg. 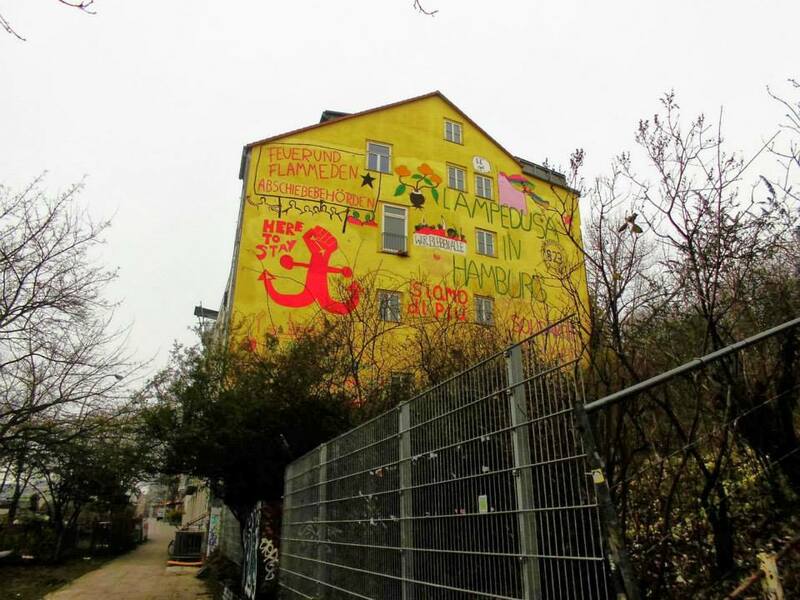 One day before the big demonstration on December 21st, investor Gert Baer and owner Klausmartin Kretschmer demanded the eviction of the Rote Flora squat. Even though it would take them months to get a judicial decision on such an eviction, their ultimatum was a direct provocation. Late in the evening, the Davidwache cop station at the Reeperbahn was effectively attacked by more than 200 people (see videos here: i, ii). 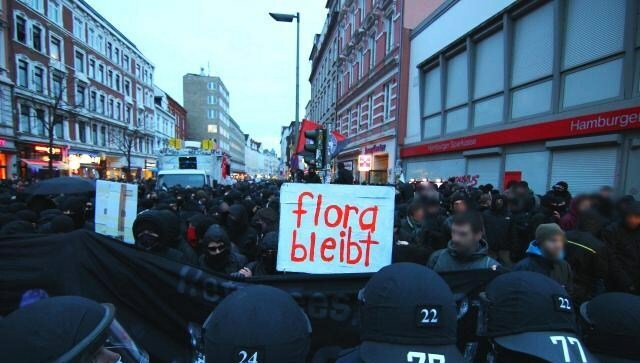 More than 7,000 participated in Saturday’s protest (others estimate a total of 10,000 people) against attempted eviction of the Rote Flora squat, a building occupied for over 24 years, threatened to be sold by owner Klausmartin Kretschmer. 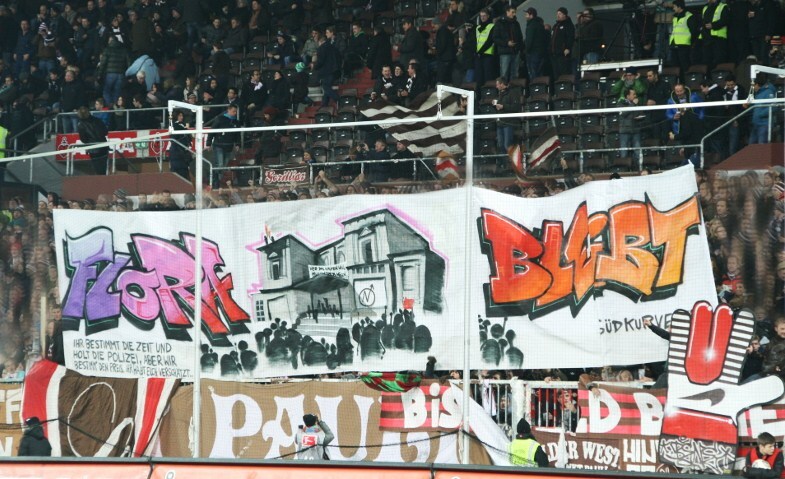 Additionally, the mobilization referred to the right to stay for refugees and the Esso houses at the Reeperbahn, but was also directed against gentrification, daily surveillance, and repression within the “danger zones” (authorities are calling parts of Hamburg danger zones, like the area where the Rote Flora squat is located). Meanwhile, in the early hours of Sunday, December 15th, the Esso houses were evacuated by police and municipal authorities on the pretext of danger of collapse. 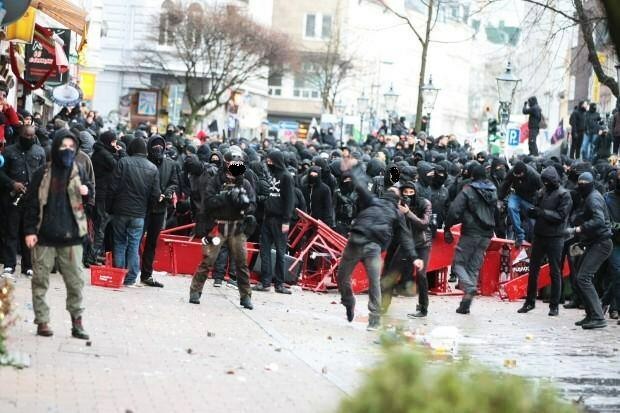 On December 21st, the police attacked a large contingent of protesters shortly after the beginning of the noon demo in the Schanze district, to prevent people from continuing the protest. The Hamburg police announced that the demonstration “started too early” and was therefore stopped; later they claimed that first they were attacked, and then unleashed a crackdown. Truth is the demo was halted at circa 20 meters from the Rote Flora squat, when the cops used water cannons, baton charges and pepper spray against protesters. Despite the repression blows, many demonstrators fought back, and it came to strong clashes. Police forces were pelted with stones, bottles, fireworks, smoke-bombs, and other objects. In addition, construction barriers and other materials were used for street barricades. The situation went out of control, and cops were massively attacked. 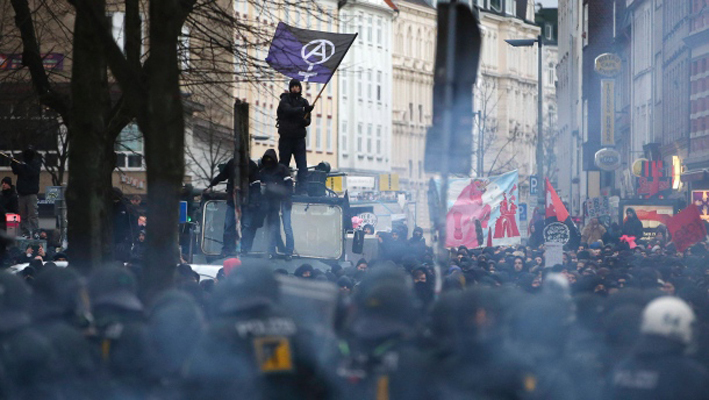 Amid street battles, two cops reportedly drew their weapons at people (a rumor regarding a warning shot has not been confirmed), and repression forces kettled almost the whole of Schanze. Many protesters were heavily injured by cops, while anti-riot squads attempted to detain demonstrators en masse, but mostly to split blocs and chase people away. 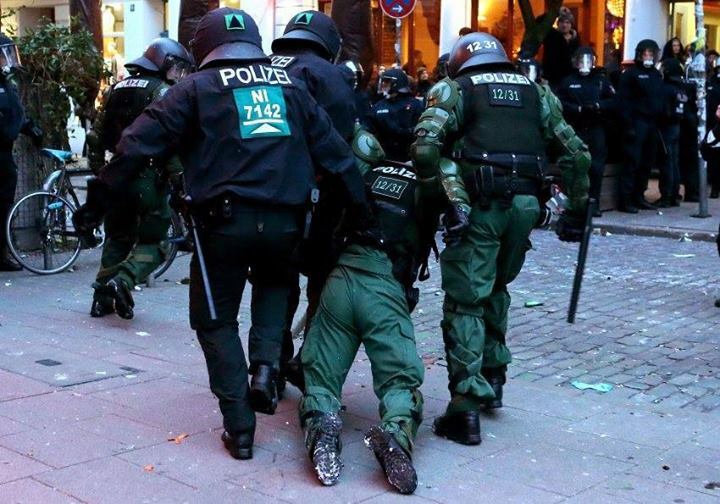 The Hamburg police announced that 19 people were taken into custody, investigated for ‘committing a breach of the peace’. The legal aid team (Ermittlungsausschuss Hamburg) counted approximately 260 arrests/detentions, and more than 500 injured protesters. One of the arrestees, who did not have German documents, was kept in custody. Hamburg’s free radio FSK transmitted live reports from the streets all day. More videos here: i, ii, iii. More photos here. Later that evening, protesters tried to carry out further rallies and spontaneous actions in the inner city, and some skirmishes broke out. Spontaneous gathering and barricading took place in front of the Esso houses, too. 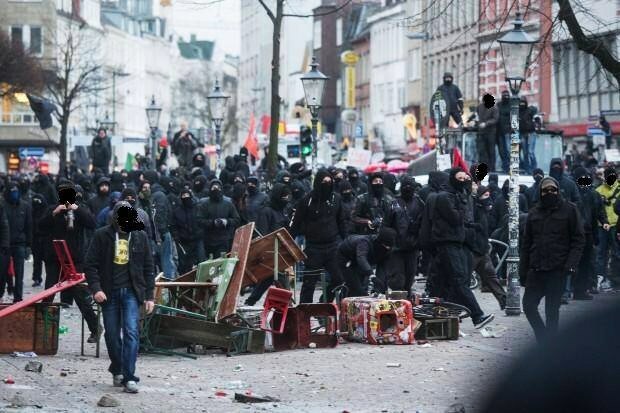 Around the St. Pauli district, some of the actions included attacks on the Empire Riverside Hotel, stores, cars (smashed windows), the Hamburger Sparkasse (Haspa) and other bank branches. Surprise demonstrations and direct actions took place the whole night. At the same time, solidarity actions were called in other parts of Germoney. 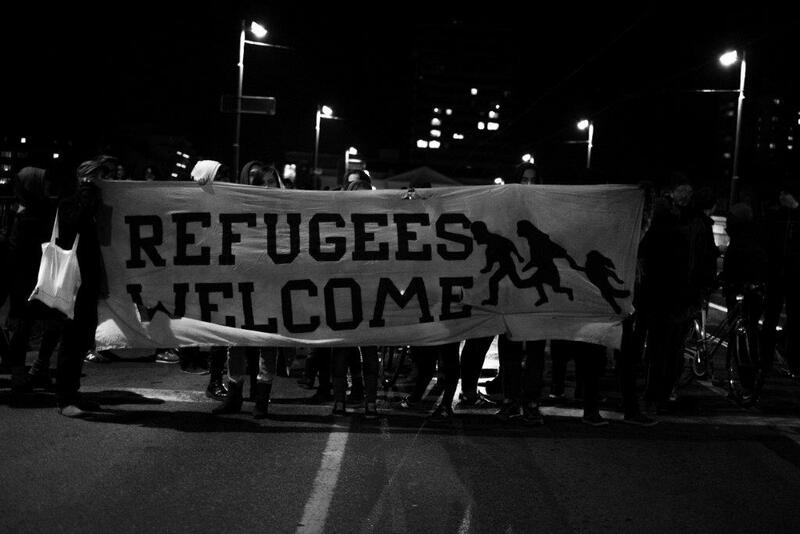 Solidarity to the Oranienplatz protest camp, the Rote Flora squat, the Esso houses initiative, and all combative refugees and migrants! Further documentation, in German, here.